The port of Monaco is undergoing an extensive construction process that will help double the port's capacity and protect it from heavy eastern swells and dangerous Mediterranean storms. The new port will include two unusual pontoon-type breakwaters as well as an additional hectare of land reclaimed from the sea. The project, costing more than 243 million euro, was initiated in June 1999 and is today slightly ahead of schedule. The existing port was built at the beginning of the century. At that time the water was too deep to allow, using building techniques of the day, construction of a jetty and counter jetty to provide adequate protection within the harbour. Even today the project faced special challenges caused by the narrow sea base, the depth of the sea and the weak seabed, which ruled against the construction of a traditional breakwater made from caissons placed on an underwater stone foundation. Another solution had to be found, a solution that would respect both the sea and the urban environment - and at a reasonable cost. The designers turned to a new, ecological ‘fixed seawall’ concept patented by the principality of Monaco. Based on the new concept, a unique structure including two unusual pontoon-type sea walls was designed to last for one hundred years. The extension works include six different project parts, the three most important elements being a semi-floating breakwater, a platform area created on reclaimed land and a counter jetty. The French company Fugro-GEOID was sub-contracted for all surface and underwater positioning services, bathymetric and seabed surveys and monitoring and control of construction in progress. One of the most important tasks for this sub-contractor was the positioning and control of the movements of the giant main breakwater during the critical phase of clamping it to the land abutment. This operation consisted of attaching the floating breakwater into an 8m diameter steel ball and socket joint situated 9m beneath the water level. The two pieces – ‘female’ for the port, ‘male’ for the semi-floating monster - had to be adjusted with a high degree of precision: the room for manoeuvring was no greater than two centimetres in all three dimensions. At an early stage in January 2002 systems were studied that could comply with the specifications. The main steps in survey work involved definition of the system and design of the special fitting brackets, installation and survey of brackets on the jetty at the dry dock in Algeciras, software development and system tests, metrology surveys in platform area and inside the receptacle and installation of equipment and tests prior to arrival of the jetty. The success of the operation required two months of very detailed planning and preparation. 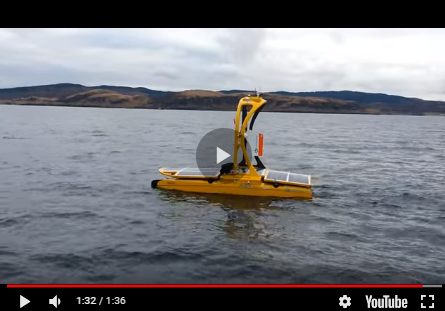 The demanding positioning tasks were completed with the help of two high-accuracy Trimble MS750 GPS receivers (for position and orientation) and an IXSEA OCTANS motion reference unit (for the pitch & roll and heave). In addition, three motorised total stations, including two Trimble ATS total stations, were used for redundancy and fine-tuning the position to a few millimetres. All sensors were interfaced into a Fugro Starfix Navigation Package for real-time 3D display. A Prove dual underwater laser system and Tritech scanning profilers were used for control of the 3D positions provided by the former systems. Data from all systems was compiled and sent to an offline computer for step-by-step display on AutoCAD 3D. A team of nine surveyors was employed to operate the system on a 24-hour basis. The main breakwater was built in one piece, on dry land at the foot of the Gibraltar Rock at Algeciras, in a 400 metre long basin. The fact that all of the seven caissons needed for the port extension were prefabricated outside Monaco helped to minimise disruption to daily life within the city and reduce the impact on the natural environment. Later on, the basin at Algeciras was opened to the sea and the breakwater was floated. It was then towed to Monaco: the nine hundred nautical mile sea voyage taking twelve days. The floating jetty arrived in Monaco on schedule on Monday, 26th August, pulled by one of the most powerful tugs in the world, the 30,000 horse-powered Smit London and guided by the Smit Typhoon. At the harbour, four smaller tugs took the places of these two big tugs to bring the jetty to within 20 metres of its permanent location. From that position, the fine-tuning operation began. The whole process of attaching the jetty to the platform area took 32 days in total; to the satisfaction of all parties involved, the positioning systems performed as expected and no breakdowns occurred during the operation. The redundancy of independent techniques provided very reliable information for the personnel in charge of the manoeuvre.